ISABELLA PHANTOM brush is handmade with highest synthetic ,the hair of brushes is soft silky and resilient ,All of our brushes are environmental protection ,doesn't hurt any animal. 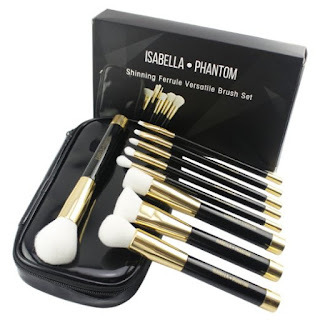 This Isabella Phantom Makeup Brush Set is wonderful! I absolutely love how soft the brushes are and how professional they look and feel. The brushes are incredibly soft but do an amazing job at applying makeup and blending. I also love that they come in a pretty little storage bag to keep them neat and clean. The brushes also don't loose any hairs while in use and has taken my makeup application up a notch. I highly recommend this Isabella Phantom Makeup Brush Set!